Speichern Sie den Artikel devolo Home Control Room Thermostat in einen vorhandenen Merkzettel oder erstellen Sie einen Neuen. Comfortable temperatures exactly where you spend time, not just at the radiator. Manual temperature control at the touch of a button, right at the Room Thermostat, as well as intuitive operation of the free Apple iOS and Android app for smartphones, tablets and computers. Illuminated display to show temperature. 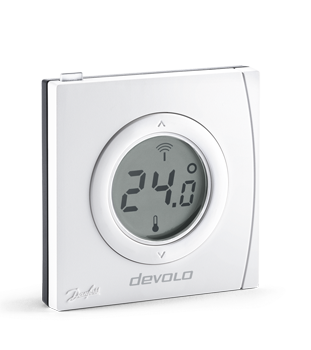 Individually expandable at any time with other devolo Home Control components. Future-proof thanks to standardised Z-Wave® wireless technology. Highest data security via certified systems in Germany. No monthly follow-up costs after purchase.